This is the 5th year in a row in which Toronto Custom Concepts have won an award from TrustedPros. We are honoured to be recognized by such a reputable renovation directory. 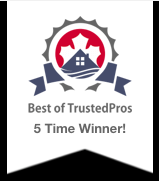 TrustedPros is very diligent in their background screening of renovation companies, so we are very proud to rank as a repeat winner in their awards. TCC ranks 5.0 out of a possible 5.0 TrustScore from TrustedPros, with the average of 3.7 for comparable renovation companies in the Greater Toronto Area. Congrats to the entire Toronto Custom Concepts team including our employees, trades, partners, designers and most importantly our customers! !